Police in China have seized tens of thousands of illegal guns and knives, in what state media say is the largest-ever haul of its kind. More than 10,000 guns and 120,000 knives were confiscated after a four-month investigation, reports said. Fifteen people suspected of belonging to a criminal network were arrested. The police started investigating after a suspect in an armed robbery in Guiyang city in Guizhou province told them about his supplier, reports said. 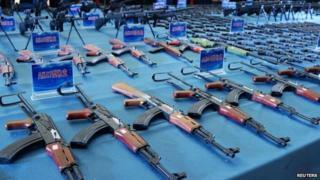 The gang's distribution network for the weapons included at least 27 provinces, state media said. Private gun ownership is illegal in China and certain knives are classified as "controlled". Du Chuang, a public security official from Guiyang, told China Daily newspaper that the illegal arms ring was a family-run business. The suspects even "gave out their business cards all over China", he said.